RedBox is a complete contact management and scheduling solution dedicated for home and small office users. Use it to set up appointments. 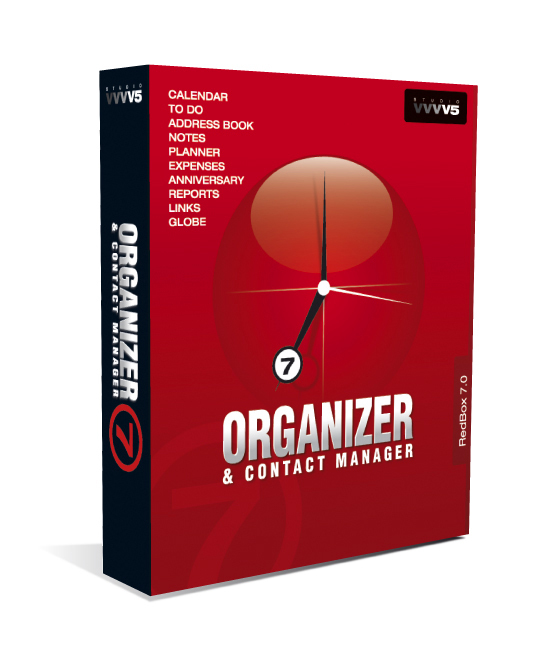 Keep track of business and personal contacts and record event history for each contact. Attach photo to the contact, autodial phone numbers, send e-mail, visit web page. Create to do lists. Plan long-term activities. Make notes. Manage and track all of your expenses. Create anniversaries. Determine the distance between cities. Create reports, send personalized letters and e-mails to your entire mail list. Sort and filter information. Print data in different ways. Publish data to the web. Export, import and backup data. Link anything with everything. And much, much more. 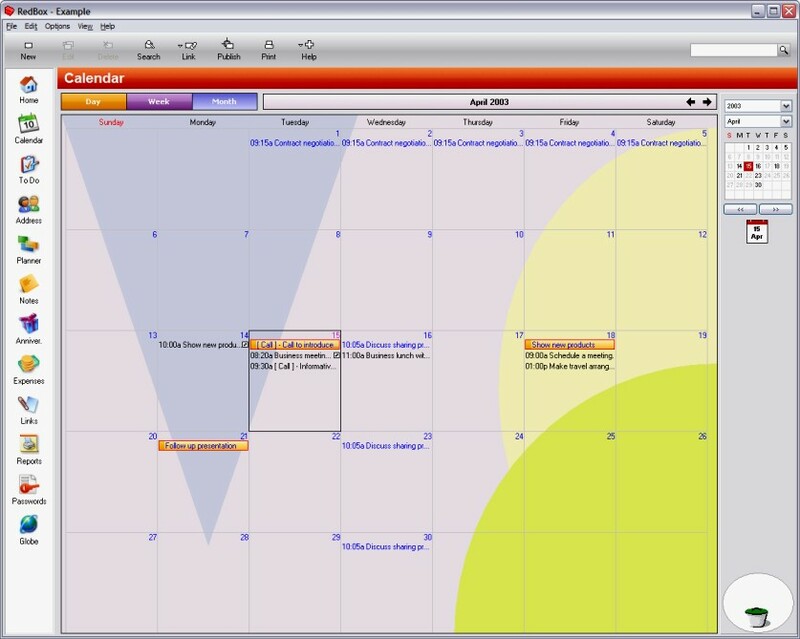 You can use the Calendar section to keep a record of daily appointments and to organize your personal and working time. To Do section enables you to keep a record of things that you need to do over a certain period of time. From the Address Book you can easily maintain your personal and business address books. 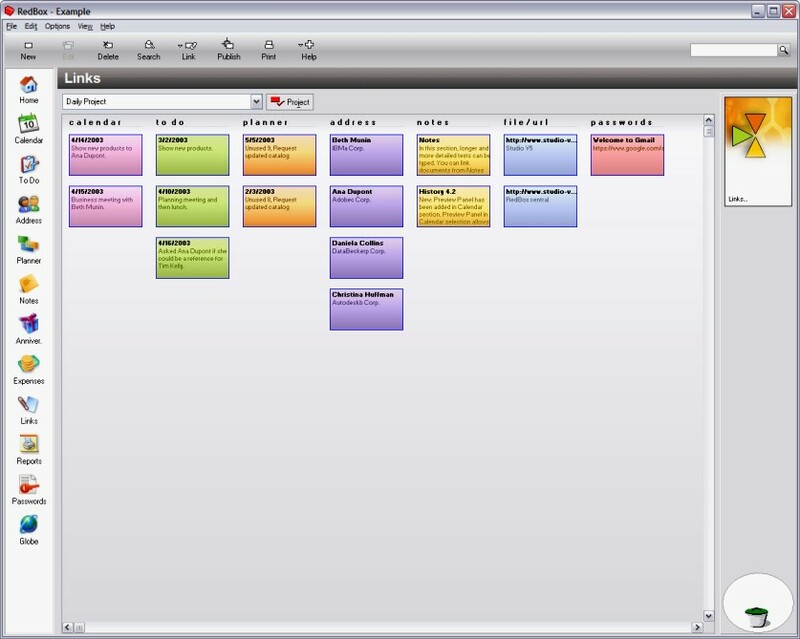 Planner helps you schedule and prepare for events that take place all day or for more than one day. Notes are the electronic equivalent of paper sticky notes. Password section enables you to safely manage all your passwords and confident information. You can use the Anniversary section to keep a list of all the important dates that you need to remember every year. The Expenses section lets you enter information from your receipts, and then it totals your receipts in a formatted expense report, ready for you to print and sign. RedBox allows you to link anything with everything. 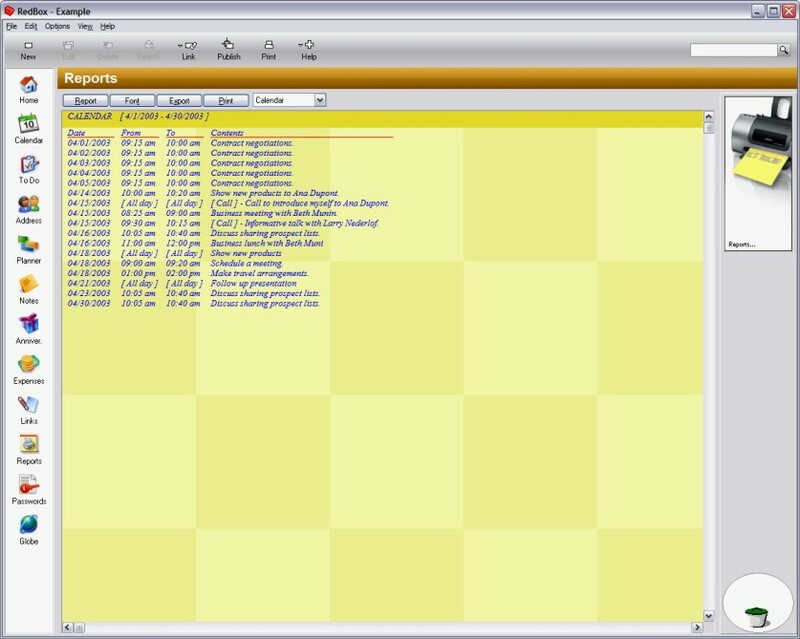 Reports section is used for summarizing results from the other parts of the application. The Globe section of RedBox displays a Globe that shows daytime and nighttime around the world. You can share information between your Palm or Pocket PC connected organizer and your RedBox database. All data from RedBox can be printed in many different ways using the templates. Redbox offers you two special features for direct data import from MS Outlook and Windows Address Book (WAB) exported file. RedBox Reminder is a small application, placed on the Windows taskbar, and it works independently from RedBox, but it collects information from RedBox. Home is the part of RedBox, which is used to simultaneously display data for any chosen day. By using RedBox Home section, you can see a summary of your appointments, a list of your tasks, anniversaries and planner projects. You can set this page to be the first page that opens when you start RedBox. Clicking on any Home part, you can access chosen sections of RedBox while keeping the Home date settings. You can use the Calendar section to keep a record of daily appointments and to organize your personal and working time. 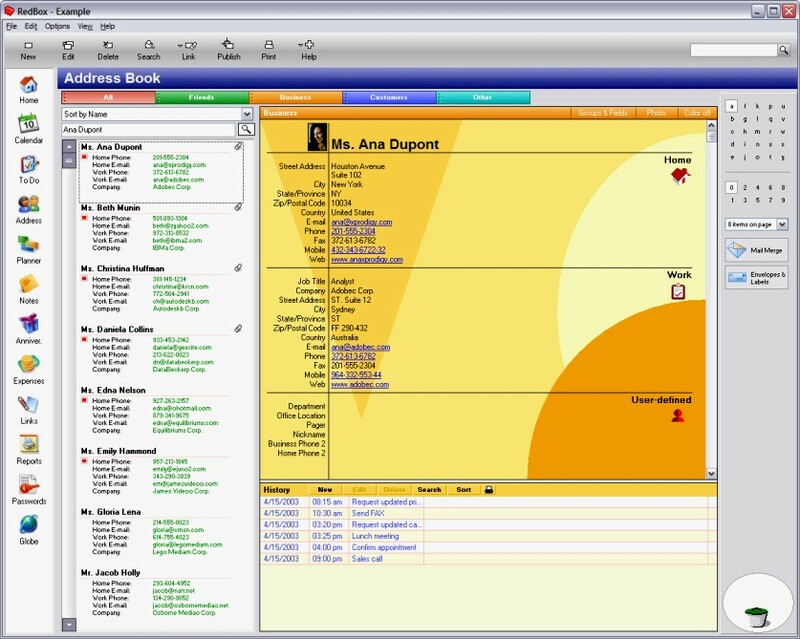 You can see your appointments in a daily, weekly or monthly view. 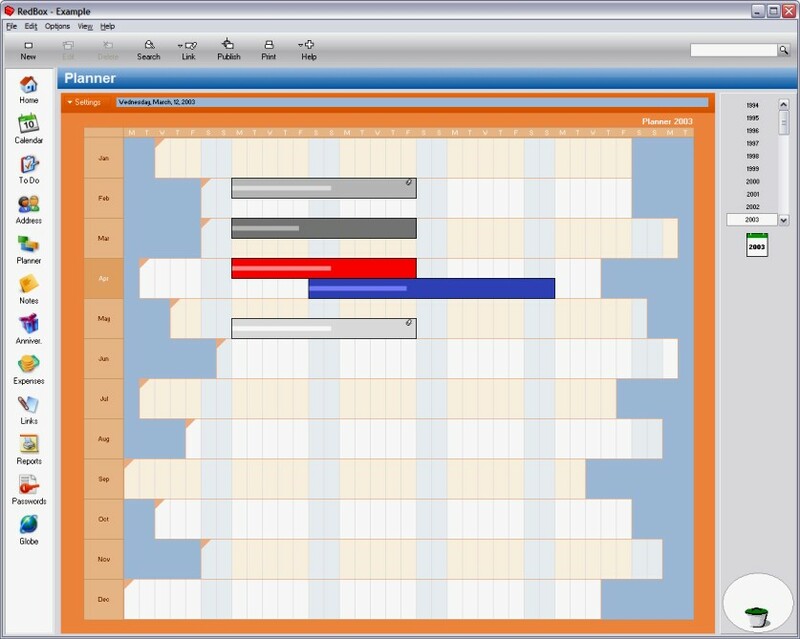 Daily time slot enables you to see the appointments and their conflicts with transparency, reschedule and enter appointments using drag & drop implementation, change time slot intervals and colors. You can set recurring appointments in many different ways or to set an alarm. Data from different sections can be shown in the Calendar. 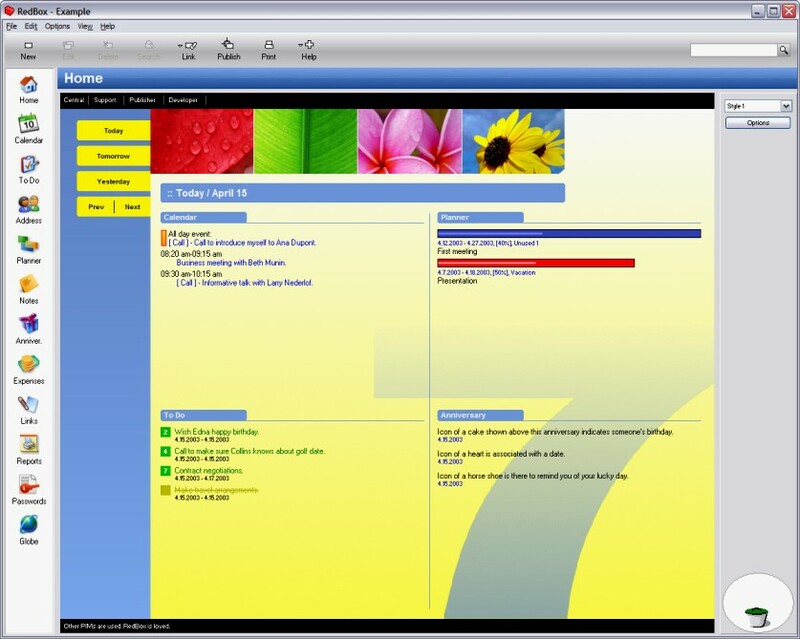 To Do section enables you to keep a record of things that you need to do over a certain period of time. Each to do activity has its own priority ranging from 1 to 9 and percentage completed which is useful to track task's status. To do activities can be filtered and sorted by date, status, priority and category. 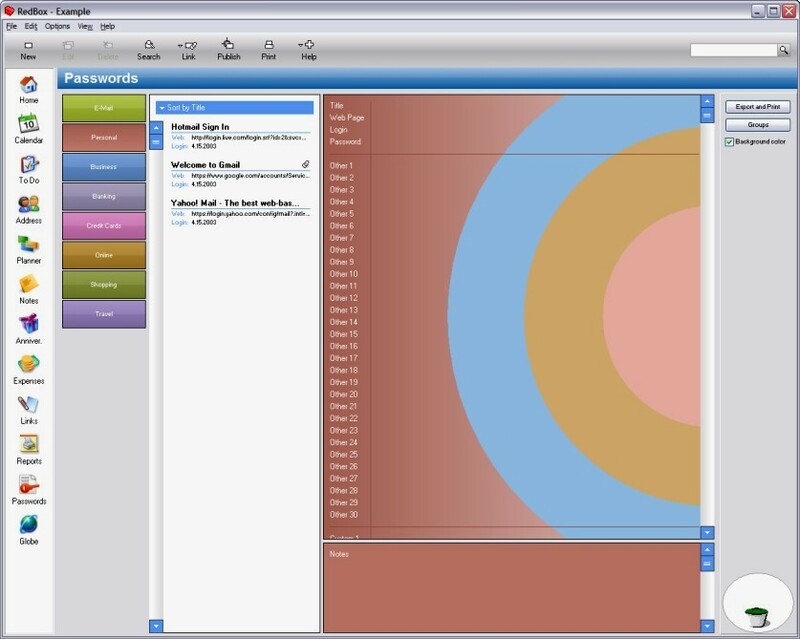 Different colors enable you to have a clear visual view of past, current, future and completed to do tasks. From the Address Book you can easily maintain your personal and business address books. Use the Address section to store the e-mail address, street address, multiple phone numbers and any other information that relates to the contact. You can make different address groups, add user-defined fields, attach photo and manage complete history for each contact. You can sort data by one of ten index fields, search them using search index or full search option. By one mouse click you can send an e-mail, visit a web page or make a phone call. Password section enables you to safely manage all your passwords and confident information. This section allows you to, with one mouse click, autosave passwords from Internet Explorer forms in RedBox by using RedBox toolbar located in Internet Explorer, to autofill passwords and other data in login forms of the selected web page, to store other important information by using custom fields and labels, to generate passwords by using password generator, to export and print passwords, to link passwords with other data in RedBox etc. All passwords and other login information will be sorted by categories and encrypted with 128 bit key. 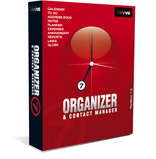 Planner helps you schedule and prepare for events that take place all day or for more than one day. With Planner, you can track events like vacations, off-site meetings, conference etc. Each planner event has duration percent, different color and description. Using full drag & drop technique you can easily change dates and duration of events. Planner also enables you to see the events from all sections and in that way you can easily view all your activities during the whole year. Notes are the electronic equivalent of paper sticky notes. Use notes to jot down questions, ideas, reminders, and anything you would write on note paper. Each notes text has a different color and create (modified) date. 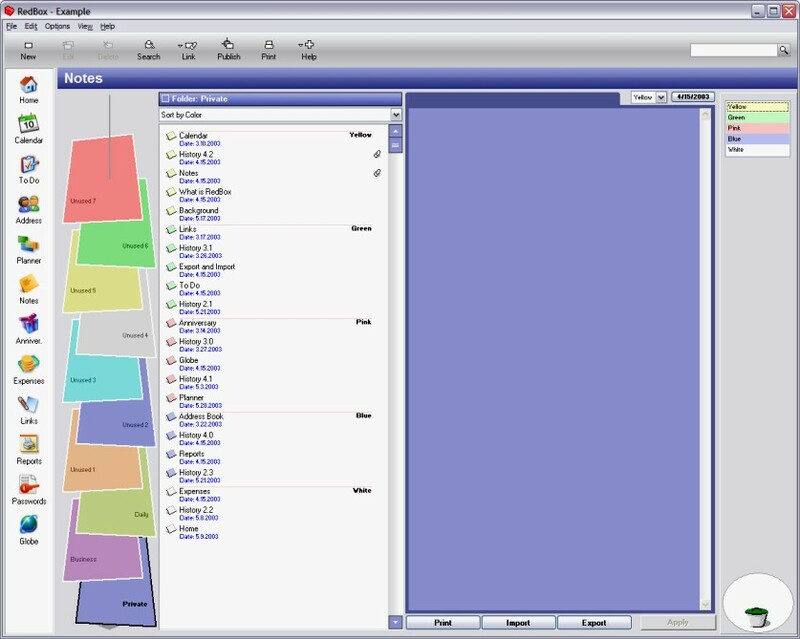 Texts are arranged in separate folders and can be easily moved from one folder to another using drag & drop technique. You can import a text in notes section from extern file and save it as separate file on the disk. You can sort Notes text by date, color or title. You can use the Anniversary section to keep a list of all the important dates that you need to remember every year. An anniversary can be a birthday, a wedding date, or a special day you want to be reminded of. You can link any of these anniversaries to icons that will have an association with them. You can easily create a Calendar event from the Anniversary and set alarm that will remind you on your important day. The Expenses section lets you enter information from your receipts, and then it totals your receipts in a formatted expense report, ready for you to print and sign. Enter the receipts just as you find them, and RedBox will take care of sorting and categorizing. The receipt type, date, and amount appear in the 3D table, and the details of the currently selected receipt appear at the top. Expenses can be sorted by date, total, type, account or color. RedBox allows you to link anything with everything, but there is more to RedBox than this. Links can be sorted into various projects. Links section can be used to create, edit or delete link projects and links contained within them. You can run through a project by selecting its elements. Each element in Links sections appears in the box. If you click on the box, you will obtain a graphical view of all its links. Reports section is used for summarizing results from the other parts of the application. You can adjust different parameters for your reports such as fields, filters, fonts, time periods etc. You can save reports as a ‘tab-format’ text file and to import them in other applications such as spreadsheet or word processor. Reports, of course, can be printed directly from RedBox. The Globe section of RedBox displays a Globe that shows daytime and nighttime around the world. The current time, date phone code and population of five different cities you select are shown next to the Globe. You can use Globe to determine the time difference and distance between two locations or cities using drag & drop technique or using Time Difference dialog box. Globe includes useful information such as language, currency, telephone codes and more about over 540 cities in its database. All data from RedBox can be printed in many different ways using the templates. Redbox offers you over 40 unique and nicely designed print templates. You can choose between: Daily, Weekly, Monthly Calendar or To Do template, combination of Calendar and To Do templates, Anniversary templates, Yearly planer, Address book templates, labels etc. Using the Import, from *.txt and *.csv files, data can be imported from other Organizers or imported from other kind of applications such as spreadsheets. But Redbox offers you two special features for direct data import from MS Outlook and Windows Address Book (WAB) exported file. You can transfer all your data from these two applications in RedBox, using only two mouse clicks. RedBox Reminder is a small application, placed on the Windows taskbar, and it works independently from RedBox, but it collects information from RedBox. It will allow you a quick view of data from RedBox and fast adding data to any RedBox section. RedBox Reminder will start the Reminder window and play the alarm sounds for events that have alarm option turned on. All this can be done with RedBox Reminder without starting the RedBox. RedBox has many additional capabilities. RedBox can create up to 255 databases that can be password protected. A Backup/Restore option allows you to save your data to a safe place, which are restored in case of system's crash. Compact option will compress database after deleting a large amount of data. All data from RedBox can be printed in many different ways using the templates and also from Reports section. Cut/copy/paste options enable you easy transfer of data within same sections and between different sections. Recycle Bin keeps last 50 deleted items that can be restored in any time by Undo command. Detailed explanations of described options, and other not mentioned here, can be found in extensive Help which is a part of RedBox. © 2017 Studio V5 Corp. All rights reserved.